It is well known globally that the availability of general purpose / specialist dogs for Law Enforcement have been in rapid decline. The good news is that Von Forell has developed a system to maintain an ongoing supply. An innovative system that works better than any system we have observed to date. It guarantees a constant supply of prepared service dogs to any Government Agency, Law Enforcements Department or Security firm. Providing the opportunity to acquire sound, confident and extremely driven animals that are prepared for your personal requirement saving on multiple resources. Von Forell addressed this issue of a forthcoming global shortage in 1988 and consequently have taken responsibility to transform Australia’s Canine Community. Extensive global travel has allowed the opportunity for firsthand knowledge of the bloodlines, their character traits, their ancestors virtues and faults and their reproductive capabilities. It is relatively easy to breed undesirable results by simply not knowing which dogs to breed with for a sound long term breeding program. Unfortunately accessing this knowledge is incredibly difficult; as there are no official resources available. Von Forell has already made all the costly mistakes, taking a life time to achieve the understanding of assimilating the correct genes for optimum results. Due to the fact that we have been supplying Australian and International Government agencies for over 20 years with specifically bred canines for a variety of purposes we know that we can help you and your agency and all its requirements. If you are interested in a Von Forell puppy or adult please complete this short profile in order to help us establish how to best help you. One of our consultants will be in contact shortly, in the mean time should you prefer to speak to us personally please feel free to call us now. About You. To produce sound dogs of a certain weight, size, and, or shape with a long term working life. Select dogs for training that have innate genetic qualities that can be enhanced, directed or channelled by training (eg directed learning). Select dogs for breeding that have the above along with any genetic component for learning to learn (eg, the ability to recover not anxious. Identify and capture the co varying helpful genes while leaving behind unhelpful co varying genes. Make decisions with complete knowledge and in a way that relies on physical manifestations of biological information “Biomarkers”. Deploy dogs into changing circumstances and learning, environments and expect the dog to exhibit a range of plastic, but adaptive responses. 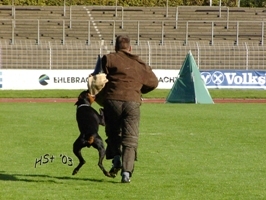 Von Forell has developed a subjective yet repeatable test, which measures the traits important for Police deployment.These puppies’ and their parents undergo an intensive selection criterion. 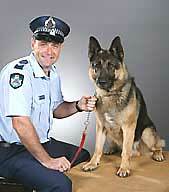 Only the most powerful animals are bred with to produce the dogs required for Law Enforcement. Our working puppies come genetically gifted with the following traits. Von Forell has made every effort to source the World’s finest dogs producing the dogs we have today. We are positive that you will be more than happy with a Von Forell puppy and to ensure that you get the very best selection that suits your requirements, we would love to know more about you and what you expect in your next dog. We would be grateful if you would complete this short profile About You in order to help us establish how to best help you. One of our consultants will be in contact shortly, in the meantime should you prefer to speak to us personally please feel free to call. Alternatively you may download our Order form. This enables us to ensure you receive a puppy from the most appropriate litter and then the most suitable puppy within the litter.